Our regular weekly activities have wound down, and the weather is nice, and I found we were drifting into summer mode. It was time to wrap up our school year and declare summer break! I always say I'm going to transition us to year-round schooling, but after the massive curriculum change this year, I need a break so I can spend the summer really planning next year, because I feel we could have gotten so much more out of it, if I'd had time to plan. We didn't quite finish our AO years, and I'll share more on that later, but we'll wrap up a few books as summer free reading. So we'll definitely be doing some summer reading, and occasional math to keep our skills fresh, and we have a few reviews here and there . . . but we are taking our much needed, and earned summer break. This is kind of a two-for-one deal. I don't have much to report for May, but it seemed fitting to share our "end of the year" pictures as my memory for the week! 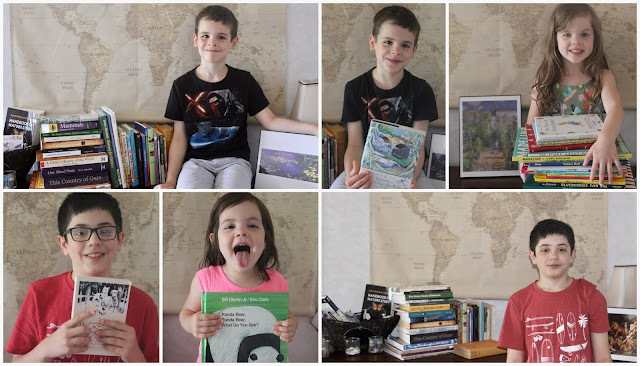 The more we turn away from unschooling and embrace actual school books the more I feel the need for summer break too. Enjoy your time off! We've always used living books, but this is the first year we've really followed a fairly structured schedule, so it was a big change for ME!